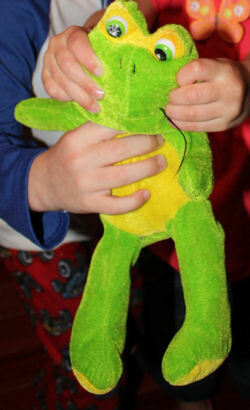 My daughter lost her green frog, and then we were lucky enough to find him. My son won it at the Texas State Fair in 2006. The brand was Kellytoy. The frog had a yellow belly and feet and the rest of the body was green. My daughter became attached to this when we started limiting her binky to sleeping only, so she missed it terribly while it was lost. She takes it everywhere we go, and we dropped it when we were out running errands. I had a pretty good idea of the parking lot it was dropped in. So, I called the stores that shared that parking lot, and I found it in one of their Lost and Founds. I would love to find one just like it as a backup, so this won’t happen again.